Anthurium crassiradix Croat, sp. nov. TYPE: Panama. Col—n: Santa Rita Ridge Road, along trail at end of road that goes to Río Indio, beginning 10.6 km from the Trans-isthmian Hwy., 150-200 m, Croat 34315 (MO 2817050, holotype; B, BR, COL, F, PMA, US, VEN, isotypes; Live at MO). Planta epiphytica; cataphyllum subcoriaceum, basi findens in fibres tenuibus, apice persistens intaclum, petiolus plus minusve triangulatus, argute sulcatus, 6-26 cm longus; lamina subcoriacea, anguste ovato-oblonga, basi truncate ad leniter subcordata, 13-25 cm longa, 4-8.5 cm lata, pagina inferiore leniter glanduloso-punctata; inflorescentia effusa et arcuata; pedunculus triangulatus, conspicue alatus, 18-50 cm longus; spatha viridis, linearis-lanceolata, 5-9.5 cm longa, 4-10 mm lata; spadix viridis, interdum pallide luteus ad viridis, luteus subanthesi; 10-17 cm longus; baccae lavandulae late obovoidae, 5-7 mm longae. Epiphyte, usually resting on smaller branches with little or no accumulation of debris; stem usually less than 10 cm long, 1-3 cm diam. ; internodes very short; roots pale green, 4÷10 mm diam., often forminga tight knotty coralloid mass; cataphylls moderately thick, green, 5-6 cm long, drying brown (B & K Yellow 3/2.5), weathering to fine fibers at base, remaining intact at apex. LEAVES erect-spreading; petioles 6-26 cm long, 3-6 mm diam., more or less triangular, sharply sulcate; geniculum 0.8-2 cm long; blades moderately thick, narrowly ovate-oblong, gradually acuminate to long-acuminate at apex, sometimes conspicuously curved to the side (the acumen sometimes flat), round, truncate or weakly subcordate at base, 13-25 cm long, 4÷8.5 cm wide, broadest between base and middle; upper surface semiglossy to weakly glossy, eglandular; lower surface matte, weakly glandular-punctate; midrib convcxiy raised at base, narrowing toward apex, diminished and sunken near apex above, acutely raised at base below, becoming convex at middle, slightly raised at apex; basal veins 1-2(-3) pair, the lowermost obscure, joining the margin near the base, the second joining the margin in the lower one-fourth of the blade or continuing to apex, forming collective vein 2-9 mm from margin, sunken above, raised below; primary lateral veins 7-12 per side, departing midrib at 35-75° angle, more or less straight to collective vein, weakly sunken above, raised below, lesser veins obscure above, scarcely visible below (tertiary veins clearly visible and weakly raised on drying). INFLORESCENCE spreading-arching, usually equalling or exceeding leaves; peduncle terete or subterete in early stages, becoming triangular and conspicuously winged, 18-50 cm long, 2.5-7 mm wide; spathe green, linear-lanceolate, 5-9.5 cm long, 4÷10 mm wide, gradually acuminate at apex, obtuse at base, often withered and deciduous at anthesis, spadix green, sometimes pale yellow to greenish yellow at anthesis, 10-17 cm long, 4÷6 mm diam. near base, 2-3 mm diam. at apex; flowers rhombic, 2.6÷5.3 mm long, 2.2-3 mm wide, the sides straight to weakly sigmoid, 5-6 flowers visible in the principal spiral, 8-10 flowers visible in the alternate spiral; tepals semiglossy, inconspicuously punctate, the lateral tepals 2.5-2.7 mm wide, the inner margins straight or weakly convex; pistils weakly emergent, green, more or less square; stigmas oblong-linear, 0.7-0.8 mm long, brush-like and exserted with droplets several weeks before stamens emerge, drying 2-3 days before first anthers emerge; stamens emerging rapidly, beginning from the base, the laterals emerging first, the leading stamens preceding third and fourth by 4-5 spirals; anthers creamy white, to 0.7 mm wide, 0.3 mm long, held equidistant at sides of pistil, not contiguous, ultimately retracting completely, beginning from the base; thecae divaricate; pollen white. INFRUCTESCENCE pendent; berries lavender (B & K Blue-purple 6/10), broadly obovoid, broadly rounded or truncate at apex with a more or less circular, scarcely paler depression, 5-7 mm long, 4÷8 mm diam., often slightly broader in the direction of the axis; pericarp thin, lacking raphide cells; mesocarp homogenous, fleshy, soft, lacking raphide cells, sweet; seeds (1-)2-3(-4), creamy white, 2.7-3 mm long, 1.8-1.9 mm wide, ovoid to oblong-ellipsoid, rounded at base, oblique at apex with elongate, sticky, translucent appendages at both ends. Figs. 37 and 38. Anthurium crassiradix var. crassiradix is endemic to Panama at 150 to 1,000 m in tropical wet and premontane rain forest life zones. The collections are principally from Panama and Col—n Provinces east of the Canal Zone in the vicinity ofCerro Jefe, the El Llano-Carti Road and the Santa Rita Ridge Road but also have been made along the Continental Divide in CoclŽ Province. The species is a member of section Porphyrochitonium and is distinguished by its thick roots (hence the name crassiradix) usually forming a coralloid mass with all the roots contiguous or nearly so, as well as by its generally V-shaped petioles and thick, glandular-punctate (lower surface only) blades that are generally broadest below the middle with a well-developed second collective vein. Older plants are broadly rounded basally or even weakly subcordate. Other distinguishing features include the three-sided, winged peduncle, the long, slender, greenish spadix- and the lavender berries. The species consists of two varieties. 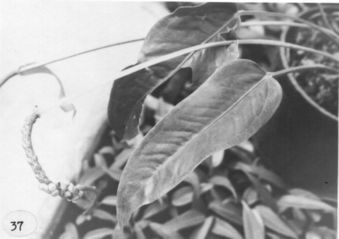 Variety purpureospadix differs from the typical variety in having purplish spadices and in having leaf blades semiglossy on the lower surface, whereas the typical variety has green spadices and leaf blades that are matte on the lower surface. 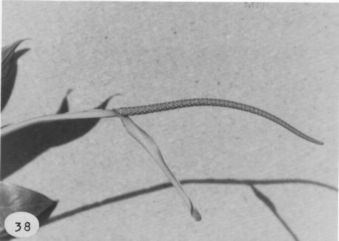 Anthurium crassiradix is most closely related to A. cartiense, but that species differs in having a shorter spadix and leaves that are narrowest below the middle and which also lack the secondary collective vein. In addition, A. cartiense apparently lacks the coralloid roots characteristic of A. crassiradix. Anthurium crassiradix is more distantly related to A. sagawae, which also has a long-pedunculate inflorescence, a long tapered greenish spadix, and lavender berries. The latter differs. however, in having much larger, elliptic blades and a four- or five-ridged peduncle. Panama CoclŽ: 600 m, 8.45N 80.30W, 7 Feb. 1983, C. Hamilton & G. Davidse 2869 (MO). Panama Col—n: 350-440 m, 9.20N 79.45W, 2 Feb. 1986, Gordon McPherson & M. Merello 8234 (MO). Panama Col—n: 200 m, 9.20N 79.47W, 29 June 1984, H.W. Churchill 5561 (MO). Panama Panamá: 750 m, 9.15N 79.30W, 23 Jan. 1986, Gordon McPherson & M. Merello 8139 (MO).